We’re going full-on fall with this autumnal take on Caesar Salad! Using Garlic Gold® Oil in the vinaigrette flavors the whole salad with roasted garlic, and sturdy leaves of baby kale are hearty enough to stay fresh for hours, even after being tossed in the tangy salad dressing. Pack along a container of croutons and a shaker of Garlic Gold® Parmesan Nuggets to add tons of crunch just before serving. Spread out the cubed sourdough bread on a foil-lined toaster oven pan. 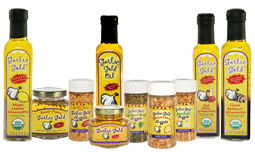 Drizzle the Garlic Gold® Oill over the bread and toast until golden brown, about five minutes. In a small mixing bowl, whisk together all of the salad dressing ingredients until thoroughly combined into a creamy vinaigrette. 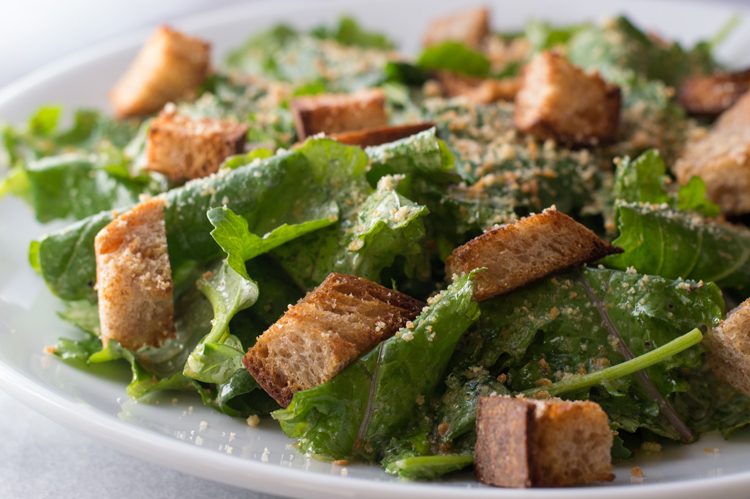 Toss the baby kale greens with as much of the dressing as you like, enough to generously coat the greens. Sprinkle croutons over the salad and shake on a generous coating of Garlic Gold® Parmesan Nuggets and serve.